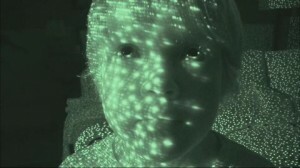 I’ve been a fan of the previous three ‘Paranormal Activity’ films since they have been released. Hell, I even own all of them on blu-ray, and yes, they do tend to scare me from time to time. So you might say, I was excited for yet another chapter in the series. 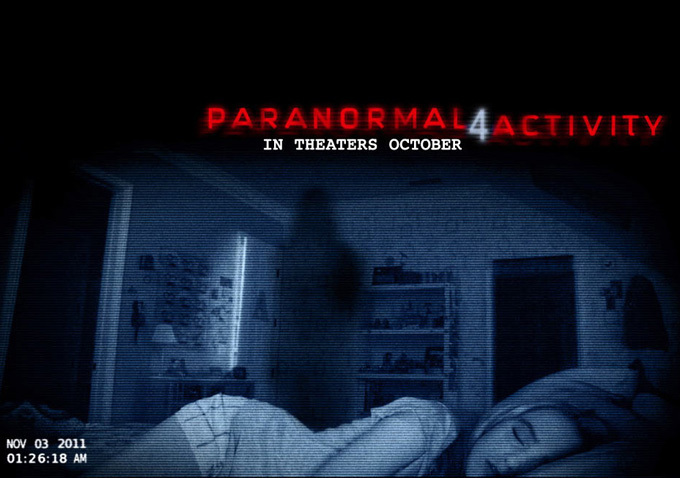 ‘Paranormal Activity 4’ has some great ideas, a couple of very likable characters, and one hell of a truly terrifying ending. Other than that, this is my least favorite chapter in the film franchise. The film plays out slower than usual, which with these films, seems longer and slower than normal. This seems to be a pretty direct sequel to part 2 of the series, taking place a few years after part 2. The first scene of the film is a couple of minutes from the 2nd film, to remind us of what happened, which was Katie (the girl from the first film) heads over to her sister’s house and kills everyone and takes the baby, named Hunter. We cut a few year into the future where it is at the end of 2011. There is a family consisting of a mother and father, a teenage daughter and her boyfriend, and 2nd grade adopted bother. The 5 year old kid from across the street wanders over in the middle of the night quite often and can be seen doing weird things, like talking to someone who isn’t there or just staring at a blank wall. The kid tells the family that his mother is in the hospital and that he is all alone. The family takes him in for the time being and this is where things start to go bump in the night. We see the usual things we have seen in the past three films, with doors opening and closing, lights turning on, and even the famous “NIGHT 1” graphic that comes up usually during the late night hours. There are few cool things that the directors did with this one including some cool tricks with the xbox kinect, laptop computers, and the climactic moment at the end. Pretty much the whole film is shot on laptop computer screens and cameras, rather than video cameras, which is a cool and different approach. The two teenagers in the film are very likable and very relatable. They aren’t the dumb typical characters in horror movies either. However, there is just a lot of down time, and a lot of the same things we have seen before. I think with the next film, because there will definitely be one, they need to abandon the formula they have and go with something new, which seems like a must from how this film ended. I still think the first film is the best. It’s still terrifying. This one though, brings the story into a whole new direction. I welcome that direction, but as far as this film goes, it just lacks the suspense and scares that the other three had, minus the end sequence. I doubt this chapter will raise any hairs or scare you on the way home, but beware, that final few minutes is pure terror. This entry was posted on Thursday, October 18th, 2012 at 11:35 pm	and is filed under Film, News. You can follow any responses to this entry through the RSS 2.0 feed. You can skip to the end and leave a response. Pinging is currently not allowed. « Film Review: ‘Alex Cross’!! !